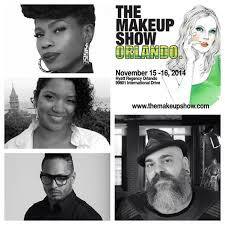 The Makeup Show Orlando Brings Top Celebrity Artists This Weekend! The Makeup Show is one of the biggest and best shows that gives beauty professionals a platform to be educated, inspired and opportunities. Over 75 beauty bands and 30 keynote speakers and seminars with top beauty professionals will be at The Hyatt Regency in Orlando taking the sunshine state by storm on November 15th and 16th. The show is an opportunity to learn from celebrity artists, see the latest products from the top professional cosmetic brands and network amongst artists from all over. Artists such as Eugenia Weston, Renny Vasquez, Eryn Krueger Mekash, Orlando Santiago and so many more will speak about how they took their craft into a career as well as teach tricks and give advice to the attendees. Sunday, November 16th Crown Brush is bringing together Face Off contestants Laura Tyler, Nix Herrera and Erik Garcia to share their experiences offer advice on what artists can do to succeed in any area of the industry.